Feeding the homeless is now illegal in Atlanta and you will be ticketed and extorted unless you pay the state for permission beforehand. Atlanta, GA — According to the official historical record, in 1621, the Plymouth colonists and Wampanoag Indians shared an autumn harvest feast that is acknowledged today as one of the first Thanksgiving celebrations in the colonies. For over a century, families have gathered to proclaim what they are thankful for while others have taken to shelters and charities to help those who cannot help themselves. However, thanks to the state, helping others during this most giving time is now illegal—unless you pay the government for permission. During this Thanksgiving week, Adele Maclean and Marlon Kautz took to the streets to begin handing out food to the homeless—like they do every week. However, this time, instead of receiving praise for their services, they were issued a notice of extortion by police in the form of a citation. “We’re looking at a citation,” Maclean said. As WSB-TV notes, Atlanta police have been handing out the flyers across the city telling people that a permit is needed to give food to the homeless. The fliers are being used as a warning by the police to stop people from feeding the homeless without first paying the state for permission to do so. “I mean outrageous, right? Of all the things to be punished for, giving free food to people who are hungry?” Maclean told Channel 2’s Justin Wilfon. 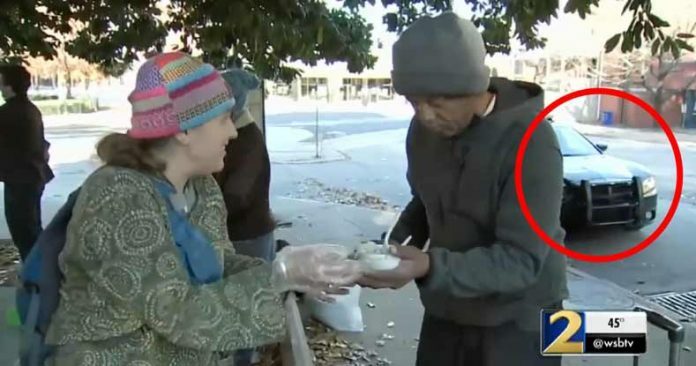 The pair has been handing out food in the same spot for weeks and they told WSB-TV that they have never heard of needing a permit to feed the needy. “It seems ridiculous to me that they would be spending their time and resources on stopping people from feeding the homeless,” said Maclean said. Indeed, it is ridiculous considering the murders and rapes taking place in Atlanta and the low rate at which they are solved. However, issuing notices of extortion, aka citation, to people for feeding the homeless is far easier and much more profitable than catching a murderer. Wilfon contacted the city to find out what was going on. A city representative said the Fulton and DeKalb County boards of health both require permits to give food to the homeless and the city of Atlanta enforces those requirements. While the requirements aren’t new, Atlanta police told Wilfon they recently started more strictly enforcing them for several reasons. The city believes there are better ways to help the homeless, like getting them into programs and shelters. They are also taking issue with the litter the food distributions leave behind. Naturally, leaving behind waste for the city to clean up is wrong — but littering is already a crime. Why not just enforce that law? Instead, good people, who don’t litter, are being punished for helping their hungry and less fortunate counterparts. Sadly, the state’s endless desire to generate revenue has led to a system which requires permits for just about every activity not just feeding the homeless. In June, a 38-year-old homeless man was attempting to earn some honest money by providing a much-desired service to the residents of Kennewick, Washington when he was threatened with extortion and arrest by the local police department, which effectively ended his enterprise. After the Kennewick Police Department threatened the homeless man and prevented him from making a living, they took to Facebook to shamelessly brag about it. The man was told that while it was illegal for him to fix bicycles, he could certainly beg for money.